So my friend and I got into a little debate about the future Justice League movie. More specifically, who the main antagonist would be. His opinion was that the JL do not have one central baddie who would take them on, that instead they would end up fighting the Injustice League. I thought that it was obvious they'd end up taking on Darkseid despite him being predominately a Superman villain. 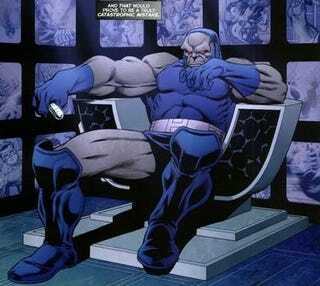 At the same time, Darkseid is way too similar to Thanos and that DC wouldn't use him if Avengers 2 uses Thanos.